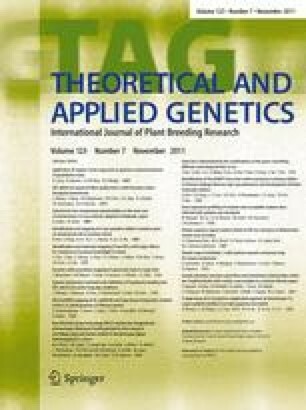 New Diversity Arrays Technology (DArT) markers for tetraploid oat (Avena magna Murphy et Terrell) provide the first complete oat linkage map and markers linked to domestication genes from hexaploid A. sativa L.
Nutritional benefits of cultivated oat (Avena sativa L., 2n = 6x = 42, AACCDD) are well recognized; however, seed protein levels are modest and resources for genetic improvement are scarce. The wild tetraploid, A. magna Murphy et Terrell (syn A. maroccana Gdgr., 2n = 4x = 28, CCDD), which contains approximately 31% seed protein, was hybridized with cultivated oat to produce a domesticated A. magna. Wild and cultivated accessions were crossed to generate a recombinant inbred line (RIL) population. Although these materials could be used to develop domesticated, high-protein oat, mapping and quantitative trait loci introgression is hindered by a near absence of genetic markers. Objectives of this study were to develop high-throughput, A. magna-specific markers; generate a genetic linkage map based on the A. magna RIL population; and map genes controlling oat domestication. A Diversity Arrays Technology (DArT) array derived from 10 A. magna genotypes was used to generate 2,688 genome-specific probes. These, with 12,672 additional oat clones, produced 2,349 polymorphic markers, including 498 (21.2%) from A. magna arrays and 1,851 (78.8%) from other Avena libraries. Linkage analysis included 974 DArT markers, 26 microsatellites, 13 SNPs, and 4 phenotypic markers, and resulted in a 14-linkage-group map. Marker-to-marker correlation coefficient analysis allowed classification of shared markers as unique or redundant, and putative linkage-group-to-genome anchoring. Results of this study provide for the first time a collection of high-throughput tetraploid oat markers and a comprehensive map of the genome, providing insights to the genome ancestry of oat and affording a resource for study of oat domestication, gene transfer, and comparative genomics. The online version of this article (doi: 10.1007/s00122-011-1656-y) contains supplementary material, which is available to authorized users. We appreciate the excellent technical assistance of Robert Campbell in SSR development and mapping and Irene Shackelford in maintenance of the BAM population. We also thank Dr. Steven Harrison for RIL seed increase.